On August 29, 2018, family members, residents, volunteers, and guests gathered in the chapel of the Our Lady of Mercy Life Center (OLOM), part of the St. Peter’s Health Partners Continuing Care Division, to witness six couples express their love for each other and renew their marriage vows. Between the couples, there were over 250 years of martial togetherness. Activities Director, Mary Lou Gaylord, and her staff helped set the tone for the joyous occasion, gathering and displaying many of the couples’ wedding photos. She also helped secure three wedding gowns, on loan from staff, and provided many of the flowers worn by the various brides and grooms. 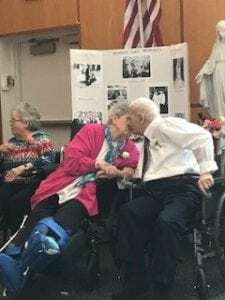 In front of rows of wheel chairs, and with the warm sounds of Perry Como’s “And I Love You So” playing, each couple loudly said their “I dos” and were met with a round of applause. 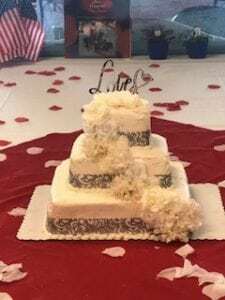 After the service, the “newlyweds” and guests gathered for a reception and enjoyed a delicious three-tier wedding cake prepared by OLOM chefs, Heidi Melendez and Katelyn Moore.